Houghton Mifflin Harcourt, 9780544974494, 288pp. 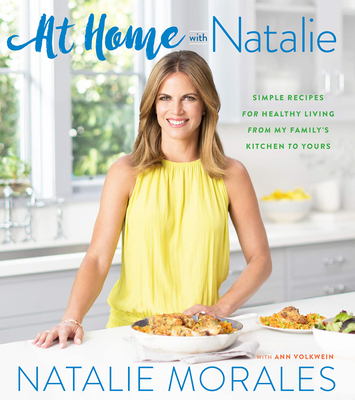 As the beloved and longtime news anchor and co-host of the TODAY show, current West Coast anchor of the TODAY show, host of Access, and co-host of Access Live, as well as the mother of two young boys, Natalie Morales knows how hard it can be night after night to get a healthful dinner on the table that the whole family will enjoy. Morales was born in Taiwan to a Brazilian mother and Puerto Rican father, and she lived around the world as a child—Panama, Spain, and Brazil. That multicultural experience fed her love for good food, but it’s her experience as a working mom that taught her how to cook on the run and keep her recipes healthful. The result is a personal collection of 125 recipes Morales makes at home for her family, including Chicken in Garlic Sauce, Grilled Chimichurri Soy Steak, Sweet and Spicy Slow Roasted Pork, and Pesto Shrimp with Lemon Pepper Fettuccine. Natalie Morales is the West Coast anchor of NBC News’ TODAY, host of NBCU’s Access and co-host of Access Live. She previously served as news anchor and co-host of TODAY’s third-hour. She joined TODAY in 2006 as a national correspondent and has reported for all NBC News platforms including NBC Nightly News, Dateline NBC and MSNBC. Morales has contributed to several major breaking news stories, including coverage of the Royal Wedding in 2011 and the birth of Prince George in 2013. In October 2010, Morales live-translated and reported on the Chilean miner rescue—coverage that was seen worldwide and recognized with a 2010 National Headliner Award. Her other notable reports include the 2009 presidential inauguration and Hurricane Sandy in 2012. Morales has also been an integral part of NBC’s coverage of the Winter and Summer Olympics since 2004. Morales has won three Daytime Emmy Awards as part of TODAY’s recognition as the best morning news program. She has won two Gracie awards in 2013 for Outstanding Series for Dateline’s “My Kid Would Never,” and in 2016 for her Today Show series “I am Unbroken.” And as part of TODAY’s ‘Shine a Light’ Campaign in 2014, Morales ran in the Boston Marathon and raised over $75,000 for victims of the 2013 bombing. Ann Volkwein has authored or co-authored more than a dozen food and lifestyle books, including 5 bestsellers. When not on the computer or at the stove, she’s out exploring the natural world with her preschooler.